Checked off from the chicken coop countdown checklist - entry door for the chickens. Close-up of the knob and pin to hold the door open. In hindsight we should have had the top of the Dutch door swing into the feed room instead of into the coop. For some reason I had it in my head to have it open away from me, into the coop. Dan accommodated my whim, and with genius, I might add! When Dan made that statement earlier this month, it was music to my ears! He had just finished the first front yard mowing of the year. If you've read my blog for long, or my book, then you know that Dan and I think our biggest waste of time and energy is having to mow the lawn. Why have we bothered? Well, because we have neighbors across the street who like the manicured suburban look. It's not that we're trying to impress them, rather, it's a gesture of respect. If we were them we wouldn't want to look at a neglected, unkempt yard across the street. 108 ft. I have several herb and flower beds there plus a number of fruit trees. A traditional front yard is such a waste: a waste of land that could grow food, a waste of time to maintain it, not to mention the fossil fuel used to run equipment and make fertilizers, pesticides, and herbicides. Add to that the cost to purchase and repair yard maintenance equipment, and it all that adds up to a huge waste of money, for those who care to think of it that way. And all for looks! I maintain that if everyone would devote at least part of their yard or apartment balcony to growing food, we could end world hunger. Our original plans were for an extensive herb garden in the front yard. I haven't abandoned this idea, but have had a very difficult time getting various herbs established. Some were successes, but I've had many fails as well. Then there's the wiregrass which invades and strangles out everything. Most discouraging. buckwheat. Currently there are our almond & crabapple trees & daylilies. We actually have several small areas which could be put to better use than mowing: the front yard, the side yard (both upper and lower), and the area in front of the garden where we planted fruit trees. All of these are small, ranging from a little over 1000 to about 5000 square feet. 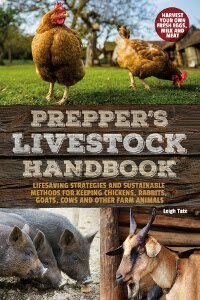 There are lots of annual things we could grow: corn, cowpeas, amaranth, buckwheat, wheat, oats, barley, sorghum, sunflowers for seed, hay grass; the list goes on. 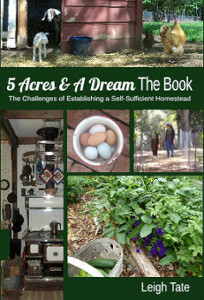 No, this will not be a strictly permaculture solution, but it will be a self-sufficiency solution. Or at least a step toward growing more of our own food and animal feed. raspberry plants, a hazelnut bush and azaleas, which I transplanted years ago. The two areas you see above will be planted in corn. Unfortunately, breaking ground with a garden tiller is hard work and rough on the tiller, but even if we had a farm tractor these areas are probably too small for that. Next to till will be in front of the house! I am so happy with this plan. We're getting to that point in this project where Dan is anxious to be finished and move on to something else! We've gotten a few more things accomplished since my last update, and have a few more to go. Door between the storage area and coop area. The bottom door swings into the storage room. allow for light, visibility, and air circulation. I really like the dutch door in the goat shed, so Dan also made one for the coop. The bottom door swings out, the top swings in. The thing we learned from the goat shed is that it's difficult to swing the bottom half in, when the floor is covered with deep litter! The top is slatted so I can see in, plus allows better ventilation and light. Best of all, it's wide enough for a wheelbarrow! rainwater catchment system on the house. It will fit under the overhang. 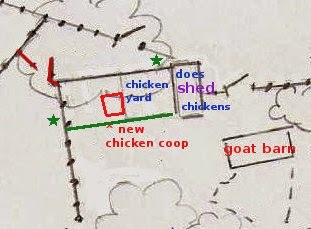 Green shows the proposed expansion of the chicken yard. (theoretically) which pasture the chickens have access to. Expanding the chicken yard will give them more room when they aren't free ranging. There's also a nice little thicket there, a perfect hidey spot from hawks. The yard will border both front and back pastures. With a second chicken gate into the front pasture, we can direct where they graze. So much to do and never enough time! Such is the plight of every homesteader. The key is to find contentment in the work itself, not in the expectation of the work finished. Next → "Chicken Door for the Chicken Coop." We had frost the past two mornings. It was a surprise after all the lovely weather we've been having. Still, our last expected frost date isn't until next week, so I'm so glad I held off with warm weather planting! Here's how things look on the verge of that. My strawberries are happy after a top dressing of compost and a good rain. The long skinny plant is a wild onion. Some of these I pull, some I let grow. Purple top turnips and Wando peas, both planted this spring. with radishes. These are purple plum radishes, aren't they a lovely color? for one plant you seen in the upper right corner, which was fall planted. The Scarlet Nantes carrots I planted last fall were sporadic in germinating. mineral for goats. I'll dry the leaves for feeding in a winter herb mix. Jerusalem artichokes are beginning to grow. overnight forecast in the high 30s (F), who would have thought? My mistake. Our small stand of winter wheat (left of the logs). Germination was fair. grow for a pretty ground cover and to feed the soil. When I walk out to the garden all I see is everything needing to be done. When I stop to photograph what's growing, I see it through different eyes and I'm happy. How is everyone else doing with their gardens so far? Who doesn't love violets? Historically they have been prized for color and for perfume. Even their Latin name, Viola odorata, hints of that. They are a medicinal herb too, commonly used as a syrup for respiratory complaints, as a traditional herbal treatment for malignant tumors, as a mouthwash (infusion) for mouth ulcers and throat infections, and in high doses as an emetic (to cause vomiting.) Permaculturists value them as a ground cover and dynamic accumulator, and I leave them grow in my garden. As a culinary herb, violets are used to make wine, candied violets, and jelly. I have two colors of violets: purple, and white and purple. Both are abundant and in full bloom. To get the best color for jelly, I used the purple. Since I was using Pomona Pectin, I followed their basic jelly recipe. Pour boiling water over freshly picked violet blossoms. Let steep overnight. 1 part violet blossoms to 1 part boiling water, allowed to steep overnight. 4 cups strained violet water. Look how the lemon juice changed the color! Add sugar/pectin mix and stir until boiling again. I sometimes use a smaller pot than my water bath canner. These will be gifts, so I used regular lids instead of Tattlers. I ended up with six half-pints of jelly plus enough to sample. Isn't it pretty? It has a delicate slightly lemon, floral flavor and would make a "something special" addition to any meal.